Glorious new nails + NRF51-DK, which is Arduino-Due-shield-compatible. Plug-in the NRF51-DK with a microUSB cable and turn the switch to “on”. Voila! Light should now be blinking. 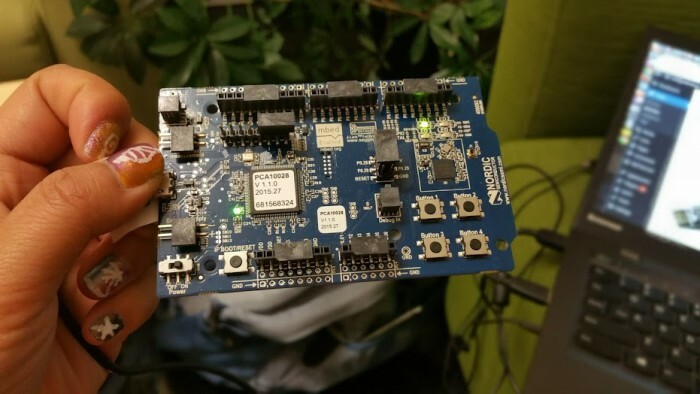 Recently after a bit of head-scratching, I found out that it’s very easy to program ARMs on Ubuntu 14.04, or at least the ARM chip on the system-on-a-chip NRF51822, an integrated circuit made by Nordic Semi that has both a bluetooth low-energy module  and a 32-bit ARM® Cortex™ M0 CPU with 256kB flash + 16kB RAM. 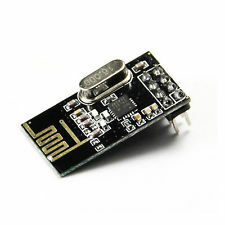 I’m exploring this chip because the atmega328p chip by itself is around $2.5 in quantity, and this chip has both an ARM microcontroller (mcu) and ble built-in for $2.5. 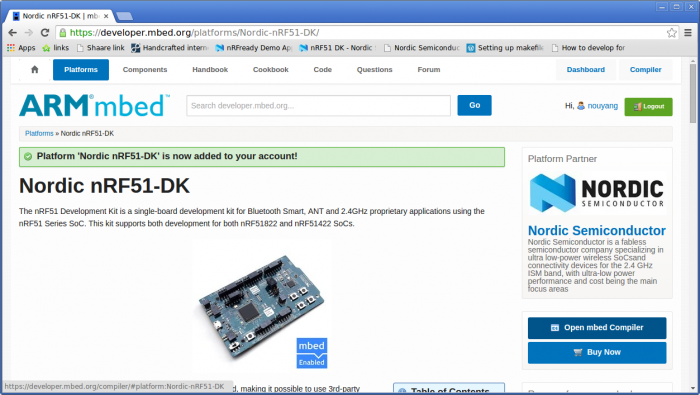 I bought the NRF51-DK recently on semiconductorstore.com for $70 plus shipping. This is the main page: https://www.nordicsemi.com/eng/Products/nRF51-DK . Yea, not much of a “get started here” anywhere on the page. The PDF tells you to download NRFgo studio and is obviously on windows. So here’s my getting started guide. Note: I followed https://evothings.com/getting-started-with-mbed-arms-new-iot-platform-and-the-nordic_semiconductor-nrf51-dk/ for the most part. 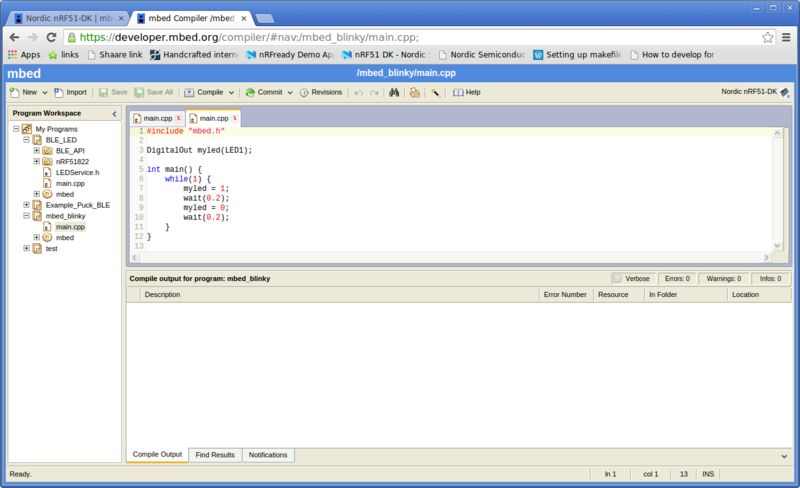 We will use the mbed compiler to turn our code from “DigitalOutput(LED1)”-esque code into .hex files for our chip, the NRF51-DK. 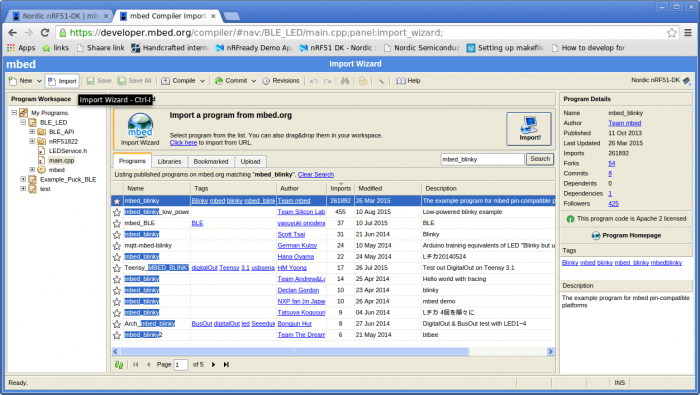 mbed is a browser-based compiler, so you hit “compile” and get a file to download. I believe it’s developed directly by ARM. mbed has a Microsoft XP look, which is quite strange-looking inside the browser, but it works. We will “program” our chip by copying the .hex file to the “JLink” drive that shows up in our windows manager, similar to how a USB drive or other external drive shows up. 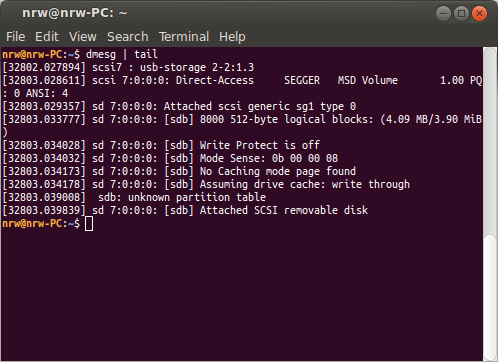 The mbed compiler takes a while (minutes) to load. Grab a cup of coffee. Hit “compile” and save the file that you are prompted to download. All done with this step! Optional: Change the wait time to 0.2 seconds and download another .hex file. 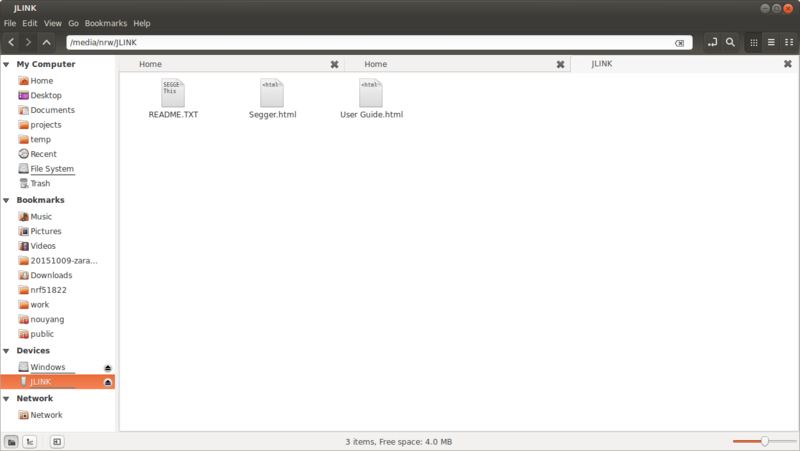 For me, I just plugged in the dev board using a micro-usb cable, turned the switch on the board to “on”, and it showed up (ubuntu 14.04) and auto-mounted and showed up under “Devices” in nautilus file manager. I’m not certain if I installed drivers along the way, but if so it must have been something sudo apt-get installable, because I don’t remember it. Drag and drop the .hex file to the JLink drive (or otherwise copy it over). Warning: drag-and-drop in nautilus pastes the .hex file over, and it’s not preserved after the chip programs itself, so use ctrl-c ctrl-v (or otherwise copy instead of cut) if you want to keep it! The JLink “drive” will disappear and after a few seconds reappear. 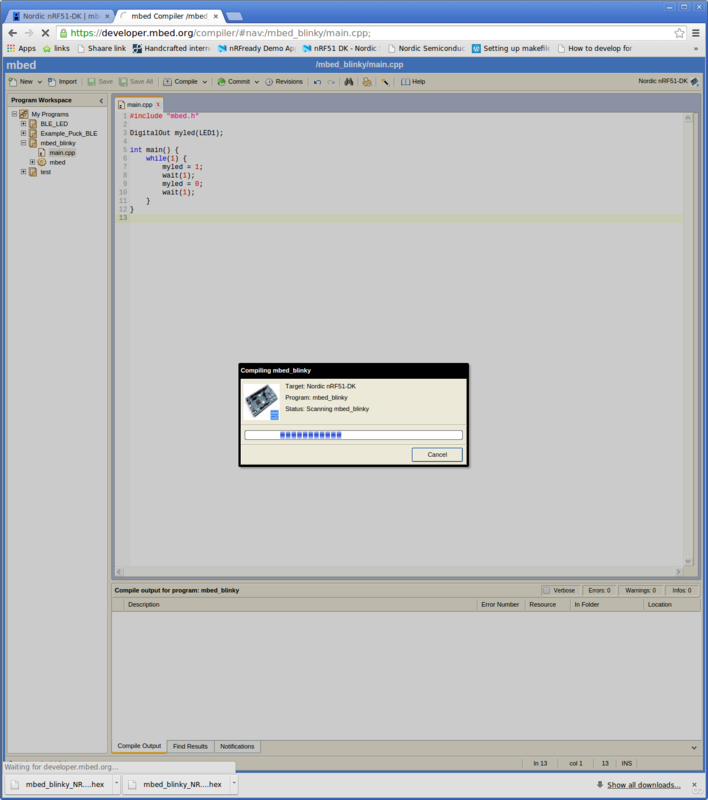 This is it programming itself and rebooting itself. Your LED1 should now be blinking! Yay! 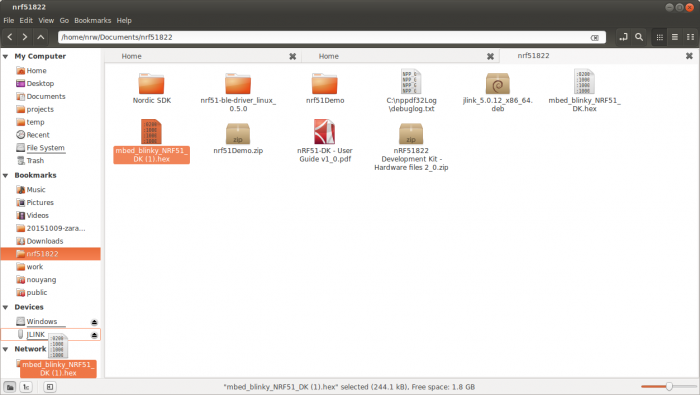 You can double-check that there’s no “fail.txt” in the JLink drive. Congratulations, you’ve now programmed the NRF51-DK on Ubuntu 14.04 to do the “hello world” blink example!